Big Celebrities That Got Fat Fast!!! – 3Stoogiez! When you’re in Hollywood and fortunately making it big, you will surely get noticed easily. And that’s the saddest part of being a star. Of course talent makes it on top. Your looks and body is a plus asset. A good face, without a good body rarely makes it big. There are a few that succeeded, but a lot lost a career after getting fat. There’s no shame in getting a bit bigger though, and we all know the struggle of trying to lose some weight. However, getting rid of fat can be made much easier by undergoing a process such as cryolipolysis, a controlled freezing method used by medical facilities such as ICE AESTHETIC. So if you’re getting as big as any of these celebs, you may want to pay them a visit! Let’s try making researches of who these big personalities that laid low because of gaining an extra weight. Mariah’s slender body did not stayed longer as she ages. But that doesn’t affect her singer career at all. She became famous because of her powerful voice and people doesn’t care how she looks, anyway. As Mike Tyson lost much of his money and fortune, his weight grows a lot bigger after being on top of the boxing world. The famous boxer is now trying to get back on his feet after all those years of being down. years. Kelly Lebrock once had the body that would be the envy of every women and the fantasy of men of the 80’s. Unfortunately, she doesn’t get enough care to maintain her perfect figure. Kirstie Alley encountered a number of negative comments over the years after her weight fluctuated. She’d go from thin to fat and then thin and then fat again. Hopefully, her recent slimming body figure is for good this time around. Yes, she’s on the list again. Pop star Britney Spears has undeniably top the limelight during the late 90’s and early 2000’s. She’s one of those music icons with a pretty face. But later, the pop icon started to gain an extra weight and stayed being fat for years. It’s good she decided to lose weight a year ago and maybe regain the title. Just hoping. Being Kardashian means you’re “big”! Yes, Rob got the name and literally, he’s “big”. 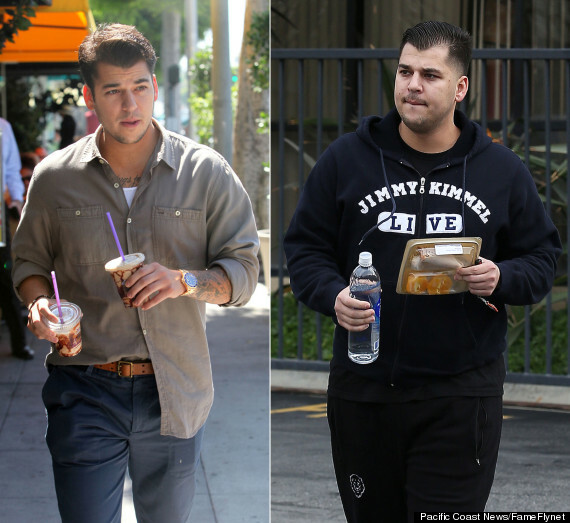 Rob gained about 40 to 50 pounds while in a relationship with Rita Ora. Good thing was, Rob is trying his best to get back to his original size. His sudden transformation make it “big” again to both his fans and critics at the same time. Yes, Christina Aguilera really did gain weight. This images shows it. But is it really a big deal? The good thing was, she was able to get rid of those unwanted bulges and managed to get back to her original track again. This former “Girl Next Door”, Elisha Cuthbert had her share of weight gain over the years and more likely to prosper as days goes by. Hopefully, she finds a way to get back to her oozing form and be the Elisha that we all loved and fantasized about in the early 200’s. Previous article Strange and Surprising!!! Jobs that Celebrities Had Before They Became Rich and Famous! Next article Meet the Top 10 Most Beautiful Women Celebrities of 2014!! The Chloe Files: Things You Probably Didn’t Know about Chloe Grace Moretz! Here are the TOP 10 Most Beautiful Women Celebrities in 2015!